First of all I would like to wish you all a Happy New Year. In 2010 we started off as a small technology related blog. Currently, we have a reader base around 170. Thank you all for supporting us in a short while & may 2011 bring loads of success in your life. Lets shift the focus on laptop screen flickering problems & the ways to solve it. Today, laptops have become almost a necessity. Though Desktop users like me won’t agree with this, as we are used to working on a desktop. But sometimes even I feel the need of laptops, mainly when I’m getting bored traveling around. But I’ve seen my friends having problems with the laptop’s screen. It keeps flickering for a moment or two & it’s quite irritating to work on such a flickering laptop. You need to adjust the screen to certain again or hold the back case of the screen tightly in order to make the flickering disappear. So lets take a look at the ways to Solve this nagging Screen Flickering problems in Laptops. Sometimes it’s not just the hardware which is causing this problem. Old Video Card drivers could also be the cause of this problem. 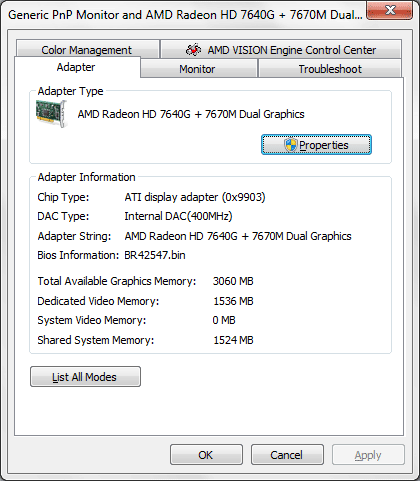 For updating your drivers, you first need to Find the manufacturer of the Video Card by right clicking on your Desktop >> Properties >> Settings tab. Then Google for the update of your driver. A low Screen Refresh Rate can also cause Flickering Problems. Normally the Refresh Rate is set around 60 Hz. 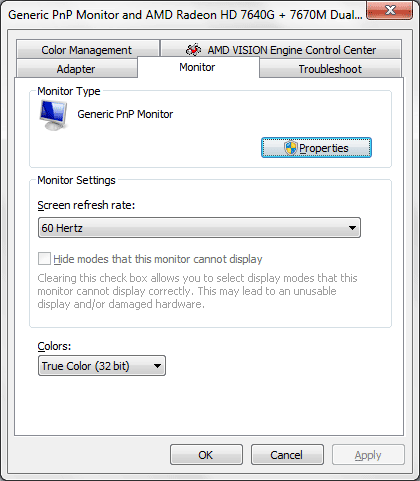 Today almost all LCD monitors are set to work perfectly for a Refresh Rate above 60 Hz. If you’ve a good system then you can increase it beyond 60 Hz. Make sure that refresh rate is compatible with your system, else you’ll get problems in viewing two or more images where in you’ll find the top most image to be transparent. Sometimes you may get your screen to flicker due a loose connection in the wire which goes from the motherboard to the LCD screen. If you are not experienced enough in handling hardware problems, then don’t refrain from consulting an Engineer who’ll do the job more efficiently. Opening the back cover of a laptop & checking for problems is a difficult task. You may end up fixing the loose connection but another problem might arise during this process. I hope these 3 Steps are enough for solving the Screen Flicker in your Laptops. Have you got more tips to Solve the Laptop Screen Flickering problem ?? Great post. This will help all the users who are looking for the solution . hope it will help me solve it , even if it doesnt thanks a lot. its a nice post. Do you have any other posts for the last solution. I’ve tried everything, even formating but my laptop still flickers. I have to connect it to my desktop’s screen to work on it!!! Anyway, maybe it’s just time to say goodbuy to this laptop and just get another one. Well I’m not well versed with laptop computing. So better consult an engineer BEFORE changing the lappy altogether. 90% of the time its loose connection, but many of the times it can be caused if the laptop is overheating. get a cooler that you put your laptop on and that would help it. I just decided to repair my broken laptop. Had problem with flickering screen, and broken keyboard. So I ordered a new keyboard, and LCD cabel, because of the flickering. Just got the parts to day, and has put it together. As you can read, and see, the keyboard is working, though, my English is’nt 🙂 Well, my screen is still flickering when I move the screen up and down. There is no viseable damage on the screen, it just suddenly started to flicker. Is it me that need to replace the screen, or is there something else that I can do? Since you’ve changed the cable and still it isn’t working I would suggest you to show it to a technician. It could also be a case that the problem maybe a minor loose connection inside. So better to get it repaired. Flickering laptop display can surely be very annoying. I had at first tried to address it by trying different resolutions and refresh rates but turns out there was a loose connection indeed which the Dell technician fixed free of charge even though my warranty was up. Thank You for your help, i opened up my laptop screen thingy, and now my screen stopped flickering, you should get a business in computer engineering because, you are good with computers! Again i just want to say thank you! There is another possible cause of LCD flickering which may be Kenneth`s problem seeing how he has already replaced his inverter/video cable. 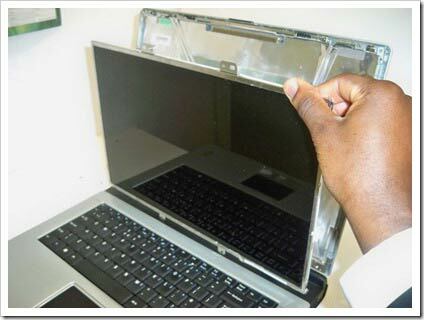 Laptops have a switch that turns on the LCD when the lid is raised in the open position and turns off the LCD when closed. Have you ever had to wiggle a wall switch to get a light to stop flickering or on a table lamp switch even? The principle is the same, these LCD switches can display a variety of symptoms when failing, flickering is not the most common symptom, but this switch should be added to your troubleshooting list if the most common fixes have failed to resolve the issue. Thank you Lord! Thanks a lot! My problems is little different. The back light of my laptop screen goes off after few seconds while booting. Even though I can see the screen and give login password. I can see the desktop icons and work but have to have a closer look at screen or use other light like flash or torch. In two cases light comes back also. First, when I close and open the lid again and secondly, when the mouse pad is touched after the display of off as per time set. In every case the light remains for not more that 4-5 seconds. Please suggest what can be the problem. samuel, kaustav sounds like you both have either a backlight, connection or cable problems. I would disconnect then reconnect the cable. While you have it disconnected, check continuity if your able and visually inspect the cable. Hopefully this solves the problem, but if not, it would most likely be the backlight that`s the culprit and replacing the backlight lamp is not an easy task even for experienced technicians. The backlight is a CCFL (cold-cathode fluorescent lamp), which is basically just a small fluorescent tube inside a reflector. Probably the hardest part of the entire disassembly process is removing then separating the backlight lamp and reflector. Unless your tech savvy, you`ll probably be better off just buying another lcd. Try eBay, sometimes you can score a non working laptop cheaper than buying a lcd. It`s always good to have spare parts to troubleshoot this and other future issues. I probably haven`t told you anything that you didn`t already know, I would be interested in knowing the solution to the problem should you find it. my laptop display is not showing then how can i come out this problem . Try connecting to an external monitor. I tried all those things, but my laptop still hasn’t stopped flickering and blacking every few seconds. Any more suggestions that I can try? Or should I send it in to get fixed? May U please help in out with the same problem in the case of Desktop monitors..!